April « 2014 « Central Australian Art Society Inc. There are some experiences in life where we are able to step back and realise that we have been part of something special. That is indeed the way I felt at the conclusion of the exhibition: “The Collection: Diverse Artworks Celebrating 50 Years of CAAS”. 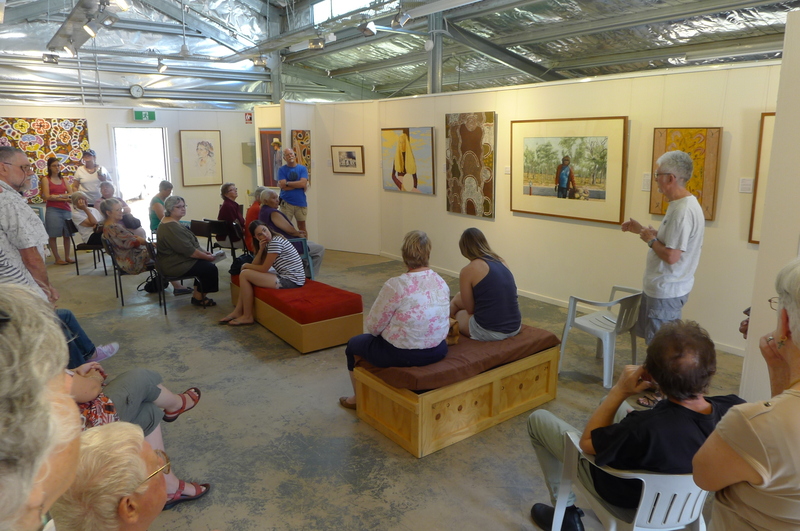 The exhibition consisted of 30 pieces selected from the Alice Springs Town Council (ASTC) Art Collection (built up from acquired artworks from our exhibitions), and opened with some fanfare on the 28th February at the CAAS Art Shed and closed on 9 March 2014. This was I believe, the most successful event that CAAS has held during my association with the organisation. It stands as a tribute to all of those involved and I’m sure that the founders of CAAS, and all those who have volunteered their services over the past 50 years would be very appreciative. When I first viewed the exhibition I was struck by the sense of Central Australia art history displayed on the walls and the social and cultural commentary that it provided concerning past decades here in Central Australia. 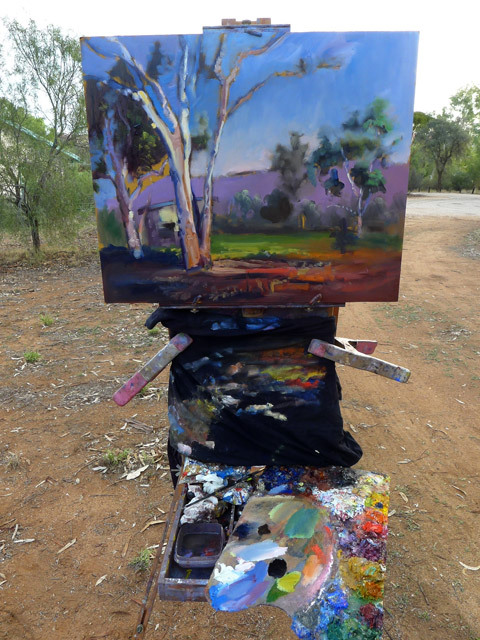 It also made evident the diversity of artistic endeavour that has occurred in Central Australia. Full credit must go to the curator Dugald Beattie for his ability to select 30 pieces from the 137 that make up the ASTC collection, and create a coherent exhibition – a task that would not have been an easy one. We were particularly fortunate to have Alison French (Art Historian, Australian National University, Canberra) open the exhibition. She was able to provided details about many of the pieces and the artist behind them. This was particularly evident on the last day of the exhibition when CAAS held a “Meet the Artist” event that was well attended by both the general public and artists. I therefore like to take this opportunity the thank all of those who were involved in the organising and presentation of this exhibition, particularly the CAAS committee members who I know volunteered many hours to see this come to fruition. 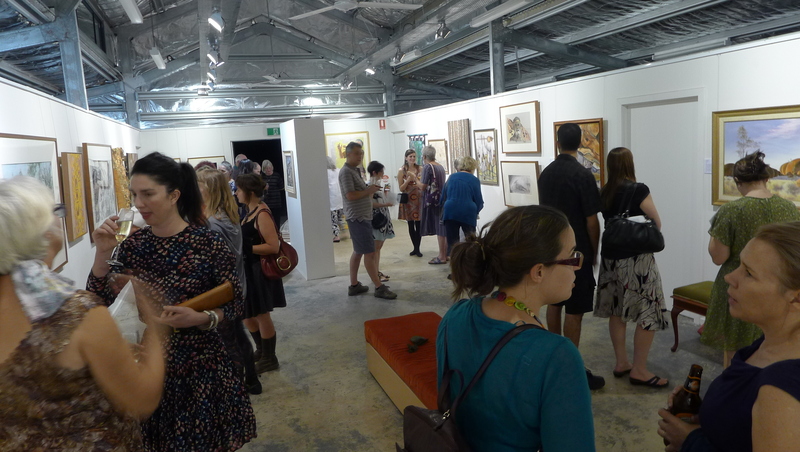 The success of the exhibition also highlights the contribution that CAAS has made to the community of Central Australia over its past 50 years of operation. CAAS volunteers fill a critical role in the development, delivery and maintenance of art in this region and are hardworking, exceptional people. I therefore wish to gratefully acknowledge their contribution towards maintaining the role and success of CAAS as an organisation. On that note, CAAS will be holding our AGM shortly (April 27th, 3PM) and we are always looking for volunteers to join our committee. I can assure you that the work is not onerous and the experience is very satisfying for those who wish to contribute to the ongoing development of art in our region and who would like to meet like-minded people. Phone either our secretary Mark Wilson 0428 478 143 or myself 0466 791 400. ‘Till next time … Happy Art.